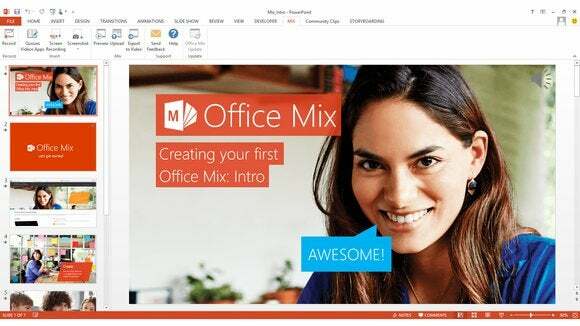 Microsoft suddenly opened Office Mix to the public on the same day that rival Adobe launched Adobe Voice, allowing customers to decide between the two new rival rich presentation apps. At the beginning of this week, neither Office Mix nor Adobe Voice officially existed. But on Wednesday, Microsoft announced Office Mix, a free add-on to Office 2013 that allows users to record a presentation in a video, and “screencast” how users might navigate through a website or application. Microsoft's public release comes right on the heels of Adobe's Thursday launch of Adobe Voice, a free app for the Apple iPad that produces short videos based on voice recordings, motion graphics and images. MacWorld rated Adobe Voice highly, calling it a “perfect video storytelling tool for the average user”. According to a Microsoft representative, the public preview is on track: "This has always been our planned date to make the customer preview publicly available and it’s unrelated to any other product releases," she wrote. So far, Office Mix runs only on platforms that also run Office 2013 or Office 365—the PC, basically. (Office for iPad does not allow plug-ins, yet.) Adobe Voice is confined to the iPad. Neither tool does exactly the same thing, it's worth noting. Office Mix is geared to more traditional business users and the educational market, while Adobe Voice appears to be lighter in tone and intent. Still, it appears inevitable that the two apps will eventually go head-to-head, and Microsoft apparently wants to encourage as much adoption as possible before that happens. If you own a PC and an iPad, and want to enrich your presentations, give thenem both a whirl—both look like excellent pieces of software. Updated at 11:30 AM with additional comments from Microsoft.